Diwali is the celebration of lights which we Indians look forward to every year. New clothes and matching jewelry is what keeps the womenfolk busy prior to these celebrations! So get party ready and flaunt your ethnic styles with the below amazing Jewellery! 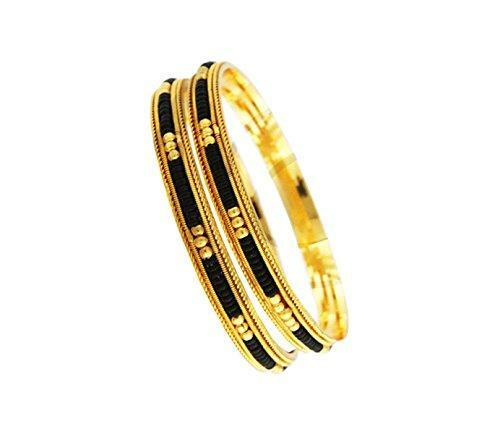 1gm Gold Plated Black Coral Designer Bangle Set – Carved from high graded and safe copper alloy and plated with 22K matt gold for the chic finish. It is suitable for regular wear or you may mix with other bangles for the desired look. The best quality of gold plating and copper alloy ensures the shine is retained throughout the years and becomes an integral part of your Jewellery box! 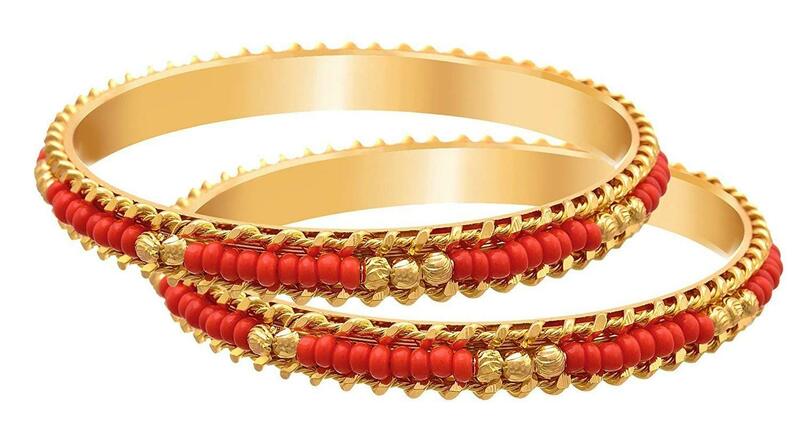 1gm Ethnic Gold Plated Red Coral Designer Bangle Set – It comes in red coral and golden rounded patterns carved on the 22K 1gm gold plating on high graded copper alloy. This ensures long lasting shine and finish. This is ideal for regular usage, new brides and can also be worn with other bangles, watches etc. 1gm Ethnic Gold Plated Red Coral Design Bangle Set – Yet another red coral and gold combination bangle set, but this is comparatively sleek in design with a netted base. Carved from high graded cover alloy and topped with 22K 1gm matt gold while the golden nets holding the red coral balls give an amazingly smart yet ethnic style. The international standards of the alloy and gold ensure long lasting shine and durability of the bangles. 1gm Gold Plated Traditional Drop Shaped Stud Earrings – Drop shaped earrings seem to be in fashion since quite some time and they can be worn and clubbed with other matching Jewellery easily. These are carved from high graded copper alloy and topped with 22K 1gm gold plating, which ensures they are safe for the skin and durable too! These come with detailed and intricate patterns all over the stud for the perfect ethnic look! 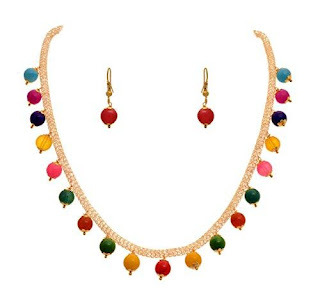 1gm Gold Plated Ethnic Multi-colour bead Designer Necklace Set – The multi-colour necklace set comes with a sweet and colourful necklace and earrings with hanging beads of several colours – pink, blue, red, yellow etc. The red earrings however add spark to the entire set! It can be worn with traditional ethnic attire or can be clubbed with business casuals or ethnic formals too! Made from superior quality high graded copper and plated with 22K 1gm gold, this is durable and holds shine throughout the years! 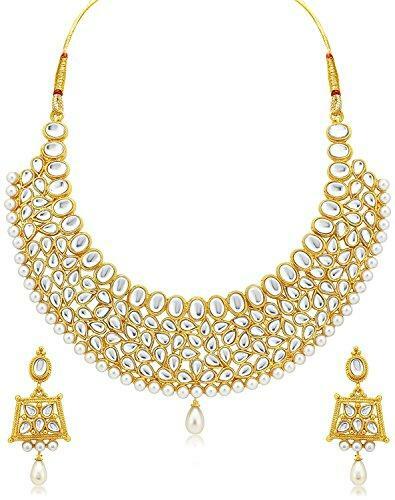 1gm Gold Plated Double Black Beaded Chain (Mangalsutra) – The black beaded chains hold a significance for Indian married women. Grab this Mangalsutra with double rowed black beads with gold plated pendant that comes in a round shape with detailed patterns carved on it. This is made from superior grade copper alloy with 22K 1gm gold plating for prolonged durability and long lasting shine. It is advisable not to apply perfumes or chemical make-up directly on the mangalsutra and clean it with soft dry cloth to remove make-up residues or any dirt to retain it. 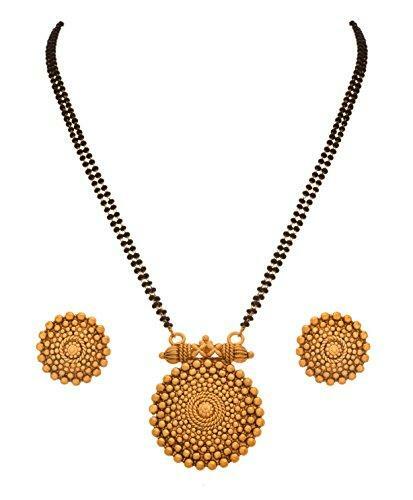 1gm Golden Jewellery Necklace Set for women – Available in 4 variants, each distinct in its design and patterns. These golden Jewellery set come with matching earrings and are carved from best grade of copper alloy with 22K 1gm gold that retains its polish and shine across years. 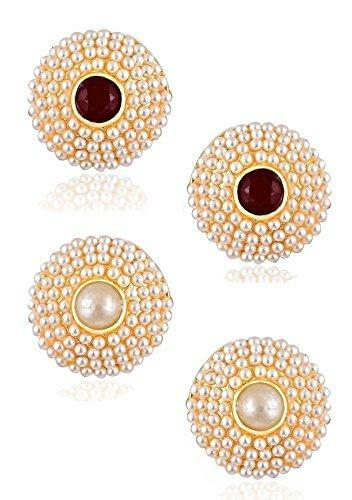 These look gorgeous with embedded white zircons, pearls and red stones! You can wear them with ethnic attire and gowns during festive occasions! 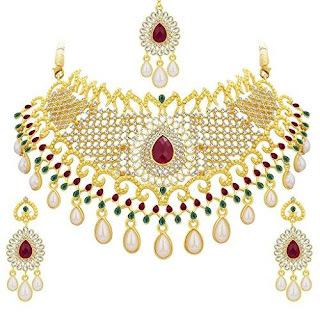 1gm Gold Plated Pearl Kundan Pendant Earrings & Necklace Set – A perfect way to adorn yourselves this Diwali with gold plated necklace set and earrings decked with American diamond cubic zirconia embedded in detailed patterns! The high graded copper alloy with 22K 1gm gold plating ensures your safety of the skin, long lasting shine and durability! This can be worn during any festivities like wedding, festive occasions etc. and will make an ideal gift for loved ones! 1gm Gold Plated Spiral Necklace Jewellery Set – High end gold polish with coin shaped spiral patterns in rounded gold plates twinned together and the dotted winged shaped pendant ending in a small rounded golden ball with stripes! Anti-allergic to skin and carved from superior quality copper alloy plated with 22K 1gm gold that keeps shining throughout! The giltz and glamour of Diwali is incomplete without the spark of gold jewelry. 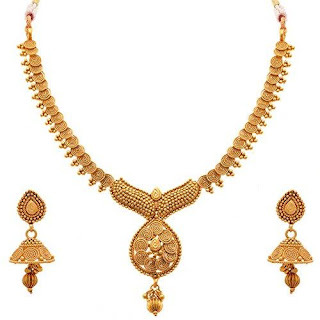 So get this affordable set of gold accessories home this festive season to deck up traditionally. You can also send these as gift set to your loved ones anywhere in US.